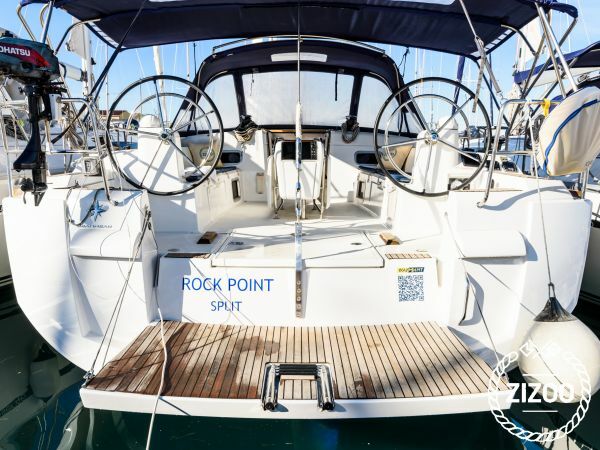 Set sail in Croatia on a 2014 Sun Odyssey 509 by Jeanneau. This 15+ meter sailing yacht is perfect for larger parties of up to 12 guests who will sleep comfortably in the Sun Odyssey’s 6 cabins. This particular model is one of the largest yachts available to charter in Trogir, but also offers easy handling for a relaxed cruise on the Adriatic. The French boat manufacturer, Jeanneau, has added much care and fine detail when designing the gorgeous interior which will make you feel like you are on a chic floating villa. Learn more about chartering a yacht in Trogir with our sailing guide to the nearby city of Split and 7-day sailing route. Sehr geräumige Yacht. Kann ich nur empfehlen. Wir haben sie für zwei Wochen gechartert und jeder hatte mehr als genug Platz an Bord. Toll!